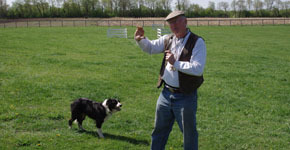 We invite you to join us for a herding dog demonstration where you will learn about dogs, sheep, wool, and human teamwork. That sounds like a lot, but it’s true. Betty, the youngest dog we are using in our demonstrations this year, keeps her focus. Photo by Amanda Martin. The first thing you will notice is the intense determination of Border Collies. They live to work and they strive to please. But we will show you also how developing teamwork with these marvelous animals requires the utmost of mutual respect. 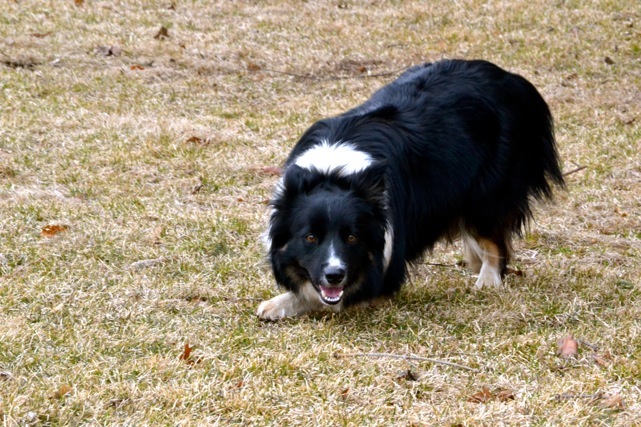 When the dog trusts the handler and the handler trusts that the dog has the gift or instinct to herd sheep and to be a partner in the work, then the training and the stockmanship go well. So, you will gain insights in your own relationship with your pets, with nature, and with working with co-workers and with children. Border Collies, sheep and handler moving about a field give all sorts of instant and dramatic feedback about how this world works. Of course the best place to watch the dogs do their work is right on the farm. But if you can’t make it to Heatherhope Farm or another place to watch the dogs, you might be able to catch us at a demonstration at a park near you. Following is a list of our demonstrations for 2015. Keep coming back to this site because additional demonstrations will be listed at a later time. And, of course, if you or your organization would like us to put on a demonstration, let us know. Find further information under the “Contact Us” tab at the top of each page on our web site. May 23, Saturday, we will be at St. James Farm, part of the DuPage County Forest Preserve District, for their “Family Field Day” as well as the Forest Preserve’s marking of 100 years of history. We will be doing demonstrations on the half hour from 11:30 to 3:30 p.m. that day. St. James Farm is at 2S541 Winfield Road, Warrenville, IL 60555. Their phone number is 630-933-7248. The event is hugely popular and includes a number of canine and equestrian demonstrations along with hayrides, fishing, dairy exhibit, fishing, food and more. Free admission with fees for some activities (not ours!). September 20, Sunday, we will do two demonstrations as part of Sheep Sunday at Naper Settlement in Naperville, Illinois. It will be great to return to this lovely site, and to this event that will include demonstrations of traditional crafts such as the spinning and weaving of wool. Abbie patiently waits her turn as John explains to the crowd. Photo by Mike Gezing.